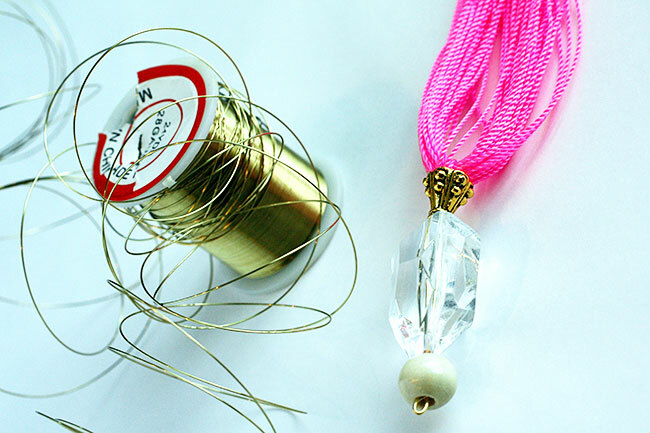 Guest Post: Carrie on DIY-ing and Styling a Long Tassel Necklace. 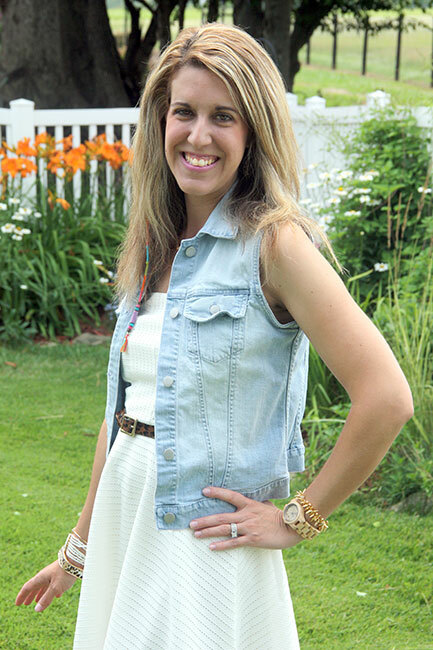 Today on my blog, Guest Posting is just about one of my most favorite bloggers. She is Carrie and let me tell you she is one very talented mamma. From impeccable house design, gorgeous house decor, beautiful and easy DIYs, to healthy and usually easy recipes and adorable everyday style, this lady does it all to perfection. Her kids are so lucky because she is a great mom. I love blogs like hers. Also, on Thursdays, with Jill (who guest posted for me on July 30th) she co-hosts "Thursday Fashion Files". Hi everyone! 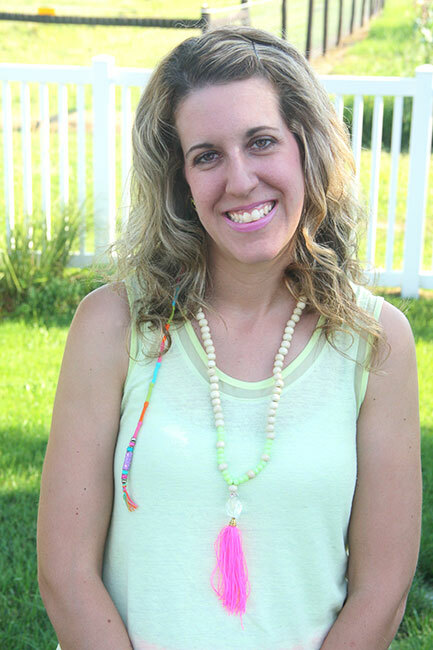 I am Carrie from over at Curly Crafty Mom and today I wanted to share a fun little DIY tutorial with you on how to make your very own beaded tassel necklace! I want to thank Ada so much for having me today, she is the sweetest and I have really enjoyed our blog friendship via comments and emails over the last year. 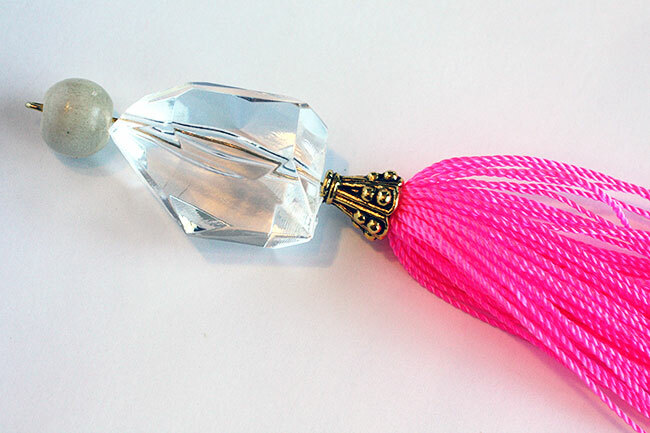 The first step of the process is making a topped tassel topper for your necklace. This is the most complicated part of the entire process, but once you do it once you'll be a whiz! 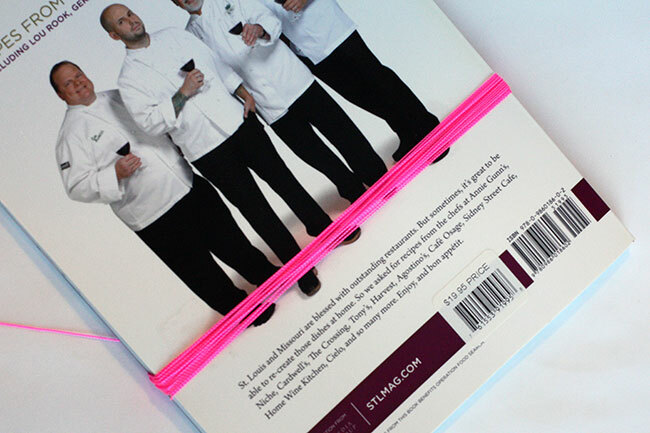 Take your nylon thread and wrap it around a 7" book (or piece of cardboard) 20 times. 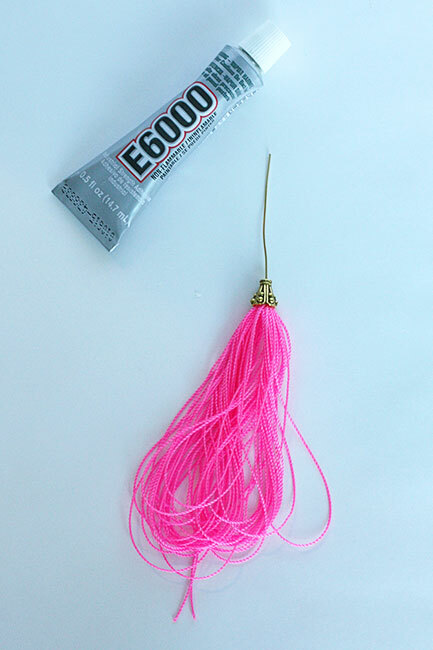 Take the 2" open eye pin piece with your round nose pliers and open up the eye/hook on the end, so that you can hook it onto the string in the center of your tassel. Then, close the hook and secure it by adding a couple drops of the E6000 glue. 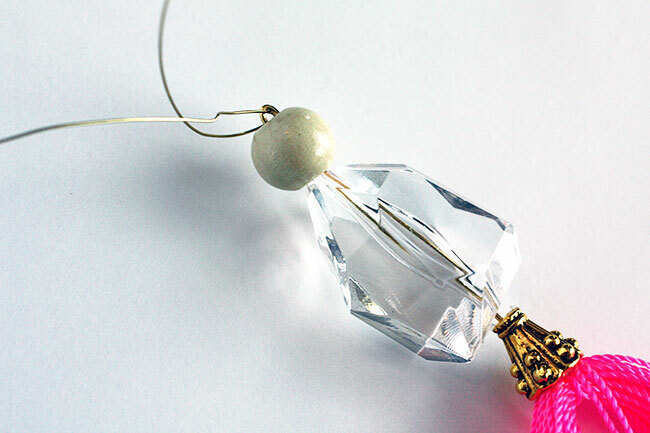 Add some glue inside the metal bead cone and then slide it down on top of the tassel. You'll want part of the tassel inside the cone. 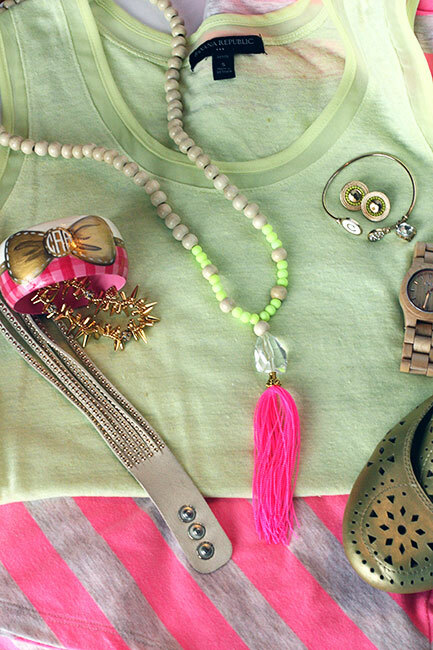 Now you can cut the tassel and trim it up. Then add your clear crystal (or whatever accent piece you chose) and a wooden bead on top of the metal bead cone. You don't need to add any glue to them, just slide them onto the 2" eye pin. You can see here that I took my round nose pliers and curved a little loop at the top of the 2" eye pin. This is where your bead wire will go through to form the rest of your necklace! Now, we have a capped topper for our necklace, but no necklace! 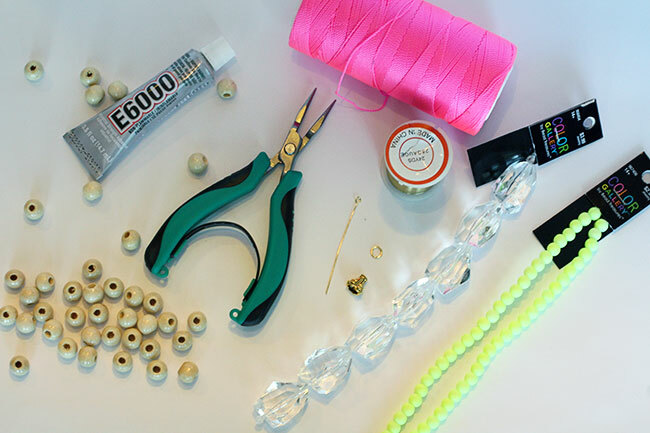 So, let's get started on the easiest part of this DIY, the beaded necklace itself! Ok, so... see this mess of bead wire? Um, yeah... be careful with that stuff. 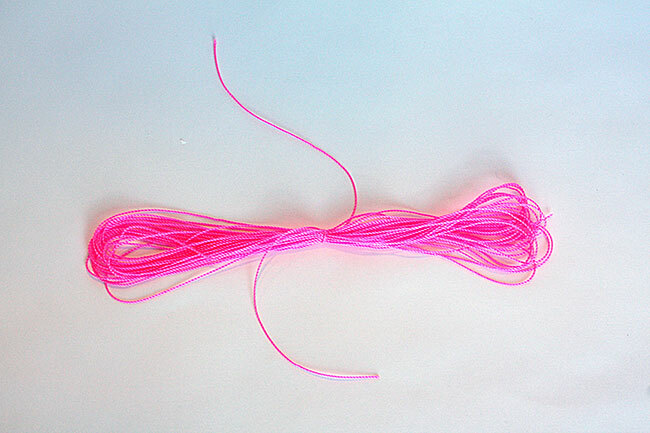 Once you unwrap it, it starts unraveling and will not stop until you have a big tangled up mess. Yes, this happened to me. :) Anyway, you'll want to figure out the length you want your tassel necklace to be and cut a strand of the bead wire at that length. 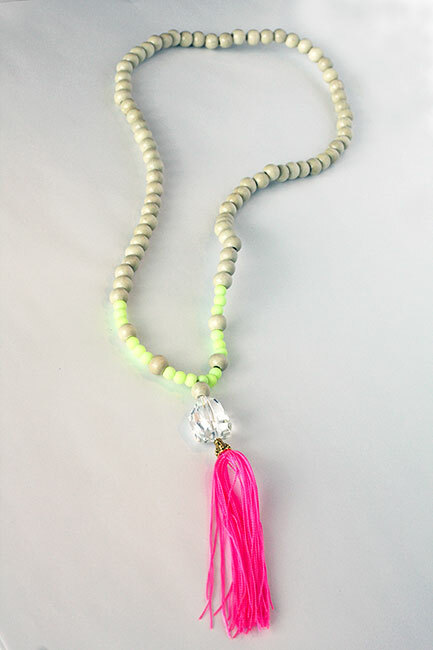 I decided to make the necklace 30", since tassel necklaces are a little on the long side. 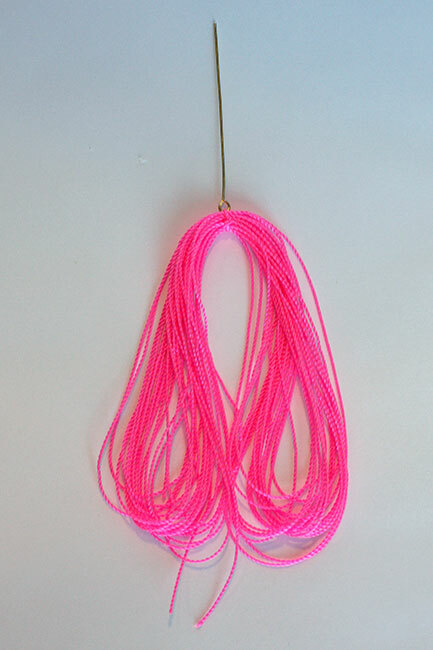 I think when I make another necklace, I will go to 31-32" for a little extra length since I am 5'7". Here is a wonderful chart I pinned (see it HERE) to go by when selecting a necklace length. Take the bead wire and pull it up and make sure it is even on both sides. Now you'll start adding beads and you want to count how many beads you put on each side so that the necklace is even on both sides of the capped topper. And, just a little about me before you go about your day (just in case you want to stop by my blog (link HERE), I'd LOVE to have you!). I am a DIY/crafting blogger with a little bit of fashion mixed in. I am a Christian, wife to my first kiss and a mother to a six and nine year old! I believe life is about not being afraid to fulfill your dreams... and, I really do believe that dreams can come to true if you believe they will! I am a seven time half marathon finisher and a marathon wanna-be, I believe in true love, enjoy pinot noir and cherry limeades, romantic dates with my husband, one on one time with my kids, reading, travel, anything Paris, Disney, and fun and carefree days with my family. Blogging is a creative outlet for me and is where I share my creativity and love for fashion. I hope you will stop by and introduce yourself! And, thank you Ada for having me as a guest poster! Also, be sure to stop by on Thursdays at 12:00 a.m. central time for Thursday Fashion Files, I would love to see your current looks! I am so happy Carrie shared a fabulous DIY with us today. When she e-mailed me first about what was doing I was so excited. I have yet to own a tassel necklace. The first one I own might be one made by Carrie. 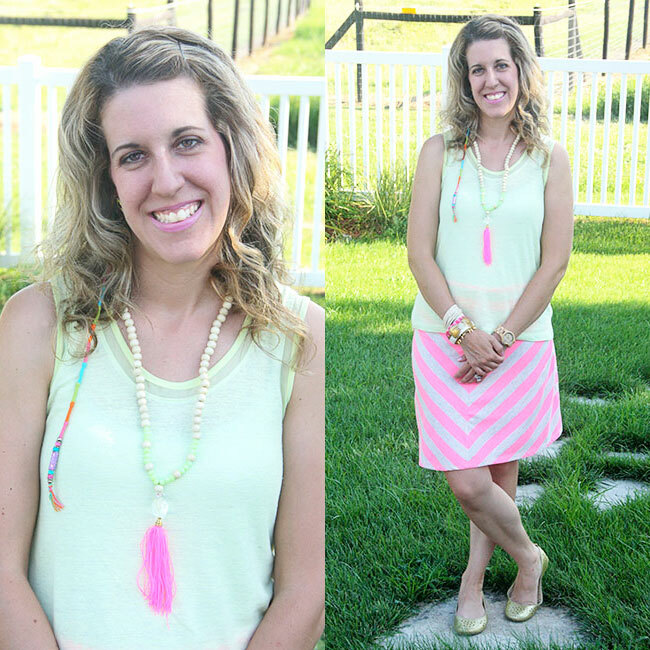 Love how hers turned out and how she styled it with the neon coral stripes and mixed+matched her cute bracelets. It is too complicated of a DIY for me personally, though. Today is Carrie's Birthday also so stop by and wish her a Happy one! Thank you.